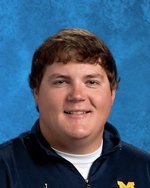 Mr. Josh Hensley attended East Tennessee State University. He received a Bachelors Degree in Special Education. Mr. Hensley played football at Volunteer High School. He is a offensive linemen coach at Cherokee, and started in 2016. Mr. Hensley was born and raised in Church Hill. He attends First Freewill Baptist Church.